Give candy bar brownies big flavor with tasty coconut. 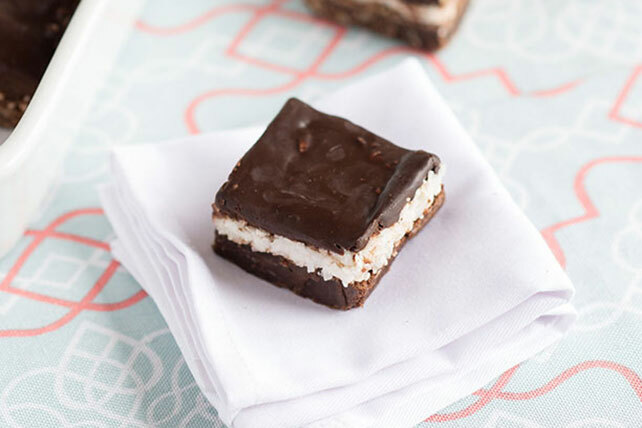 When the occasion calls for scrumptiousness, Coconut-Candy Bar Brownies are ready to do the job! Line 13x9-inch pan with foil, with ends of foil extending over sides. Microwave unsweetened chocolate and butter in large microwaveable bowl on HIGH 2 min. or until butter is melted. Stir until chocolate is completely melted and mixture is well blended. Add sugar; mix well. Blend in eggs and vanilla. Add flour and nuts; mix well. Pour into prepared pan. Combine coconut and milk; spread over dessert. Bring cream just to boil in small saucepan on low heat. Pour over semi-sweet chocolate in medium bowl; let stand 1 min. Beat with whisk until chocolate is completely melted and mixture is well blended. Cool to room temperature, stirring frequently. Spread semi-sweet chocolate mixture over coconut layer on brownie. Refrigerate 45 min. or until chocolate layer is firm. Use foil handles to remove brownie from pan before cutting to serve. Enjoy a serving of this treat on special occasions. Since this recipe makes enough to serve a crowd of 36, it's the perfect treat to serve at your next party.